There is a changing of the guard in this world we live and the ripples are hitting the NBA too. The final word is now that LeBron James is King of the NBA. Michael Jordan Heir Apparent. Master of the court. I say this not to be on LeBron James' jock but to punctuate the end at long last of this argument: Who is better, Kobe or LeBron? I'm so sick of people talking about this. We only talk about it to fill air space it seems because we get nowhere, but we argue about it over and over again anyway. So here is the final word. Interpretation & Prediction if you will. Michael Jordan, the undisputed best of all time left a void in the NBA and we've been looking for his successor ever since. Kobe had Mike down. He was so good at imitating Mike (down to the tongue waggin) he was able to come straight out of high school and play successfully in the NBA. However, he fell short of Jordan. Now there is someone who resembles MJ better. Someone who also came straight out of high school. Someone who dominates the court and is capable of building a franchise. Yeah it's taking him 3 years longer than Kobe to get his first title. But he still can get it at the same time as you guessed it... Jordan (MJ came in the league '84 got his first title '91 - Kobe came in '96 got 3 titles with Shaq from '00 to '02 - LeBron entered in '03 and can get his first in '10). This year's prediction for the NBA Finals is Cavaliers versus Lakers. 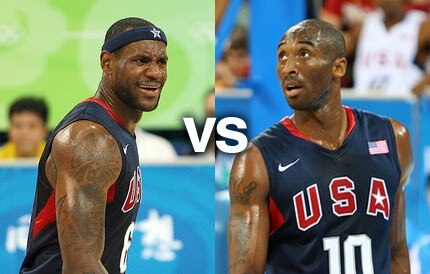 Kobe will get to hand the torch to the new MVP and the new keeper of the game, King James. Cavs win it. James is MVP of the year and the finals. And the crown of 'His Airness' finds a head that fits it. Lets not put the cart before the horse...I think you forgot to mention one important variable in this comparison...Phil Jackson! Hard to bet against this guy with his record in the playoffs. In addition I believe the west is overall a better conference. If you look at the standings 7 games separate the 8th seed from the #1 seeded Lakers compared to 22 1/2 games that separate the 8th seed in the Eastern Conference from the #1 CAVS. Lebron James might be heir to the thrown but until he gets the hardware he's just a PRINCE. Hahaha. That's real talk D. Something you forgot though is that the Lakers have losing records against the 5 best teams in the league this year. HAHA Very True...but we both know that playoff basketball is much different than the regular season...We'll see how it plays out. If the CAVS don't win, the city of Cleveland could lose the only thing goin for it.